Sources: U.S. Energy Information Administration, based on Energy Velocity. 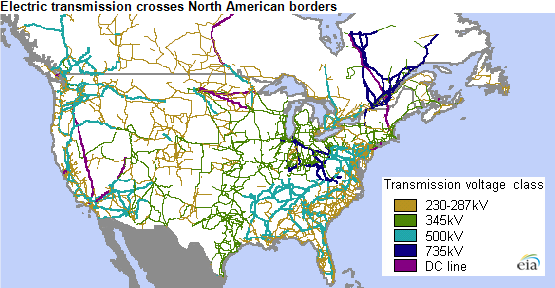 Electric transmission lines crossing the U.S.-Canadian border allow electric trading across the border. More importantly, the North American electric power system is integrated, allowing the United States and Canada to pool resources to improve electric reliability. 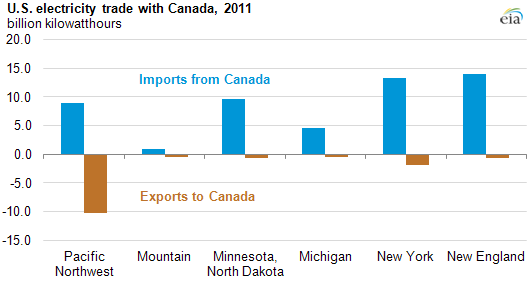 In 2011, electricity imports from Canada accounted for only 1.4% of total U.S. electric consumption, while electricity exports to Canada accounted for only 0.4% of total U.S. electrical production. Although electricity imports and exports between the United States and Canada are low compared to total U.S. consumption and production, regional integration of the electrical grids plays an important role in improving electric reliability in both countries. Three of the eight North American Electric Reliability Corporation(NERC) reliability regions span both the United States and Canada, effectively integrating the Canadian grid with the United States. (See NERC map) This interconnection improves reliability, both in sharing reserves and in guarding against cascading outages. Reliability problems and even blackouts remain possible and can affect both sides of the border. Even fairly small volumes of trade enhance efficiency. For example, seasonal variation in electric demand means the two countries can share resources: electric heating causes Canadian load to peak in winter, while the United States is largely summer-peaking (because of air conditioning). Instead of each country building up capacity that would sit idle for many months of the year, sharing resources reduces the need for expensive facilities on both sides of the border. Sources: U.S. Energy Information Administration, based on data from EIA and the National Energy Board of Canada. Trade is highest in regions with large amounts of hydropower. Canadian hydroelectric generators are concentrated in the Pacific Northwest; in Northern Manitoba, which exports electricity via transmission lines running south through Minnesota and North Dakota; in Ontario bordering New York and Michigan; and in Quebec north of New England. Certain states rely heavily on imported electricity: Maine and Vermont got, respectively, 25% and 40% of their power from Canada in 2010. There are connections between grid operators on both sides of the border. The Midwest Independent Transmission System Operator controls a portion of the Canadian grid in Manitoba. Part of the grid in northeastern Maine is controlled by the New Brunswick System Operator. Alaska is not electrically connected to the Lower 48 states, but is connected to a portion of the Yukon. High levels of networked interconnectivity can have some drawbacks, particularly around geographical features: across the U.S.-Canadian border, power flows looping around Lake Erie have presented problems for electric power market participants. Both countries, and the entities that operate their electric transmission systems, are working to improve grid reliability.